or relaxing on the sofas reading a book. 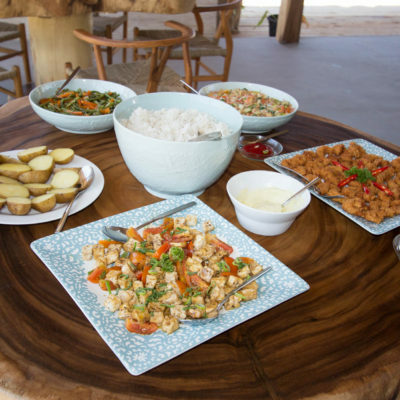 At our small resort, all meals are served family style on our giant communal table. Kalimaya is among one of the few resorts that offer the benefits of an all inclusive in Indonesia. Offering a variety of dishes influenced by Indonesian, Asian, and international cuisines to keep your taste buds entertained! 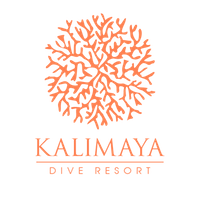 Kalimaya Dive Resort is located between two small villages which primarily rely on fishing and farming to survive. We aim to source as much meat, fish and vegetables as possible from the nearby villages. Developing these connections provides us with the opportunity to support the local community as well as allowing us to source the freshest ingredients available. Our fish is sourced by traditional practices, usually via outrigger boat using a small net, or a canoe with a single line and hook. You will be provided with breakfast, lunch, and dinner in the restaurant as a part of your stay. As well as coffee, tea, and hot water, free of charge, for your enjoyment. Soft drinks are available for purchase throughout the day. We also offer a barbeque night once per week for your chance to enjoy local grilled chicken, fish, and vegetables. We will work to provide you the best menu possible should there be any special dietary requirements. Also, any advance notice on allergies or preferences is greatly appreciated. 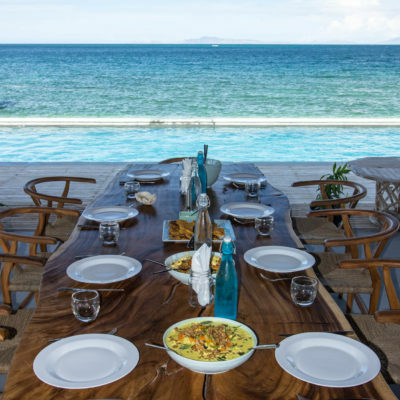 We ask our guests to understand that Sumbawa is not fully set up to supply tourism industries. Therefore, our menus and ingredients can be influenced by seasonal availability.